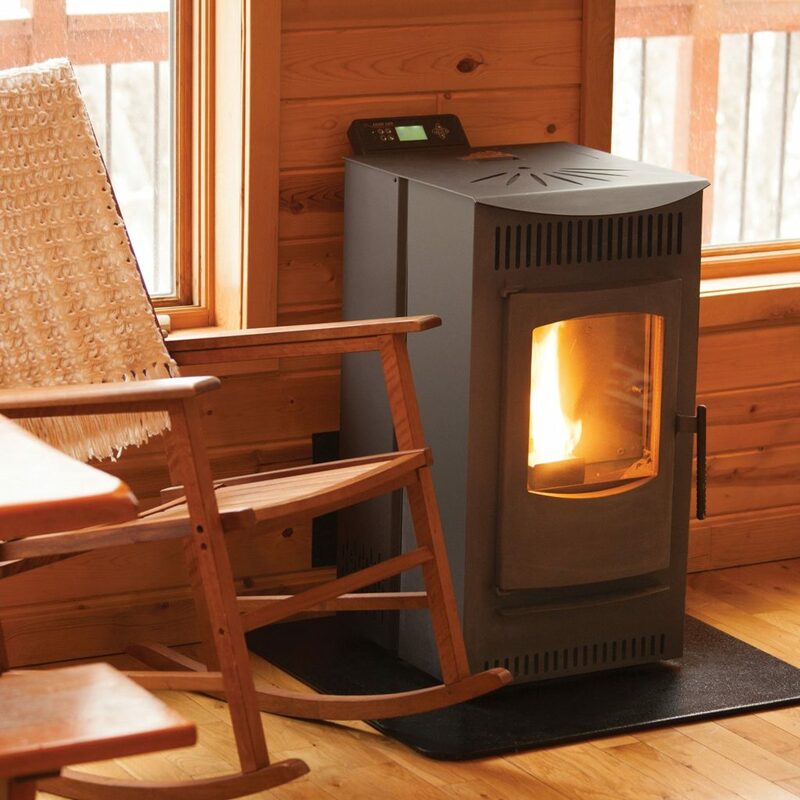 Pellet stoves are a popular option for homeowners who want a cost effective way to heat their homes, and like the rustic allure of a wood heat. The problem is that there are hundreds of options on the market, and it can be difficult to separate the good from the bad. That’s where we can help. We’ve researched the top selling models on Amazon, and our proud to present you with this year’s rankings. The Serenity is one of the most popular models on the market. This type of well received support most likely comes in response to the Serenity’s sturdy construction, reliable heating, and advanced features. The unit is well crafted, and does not have many interior parts, which helps ensure it is easy to clean. 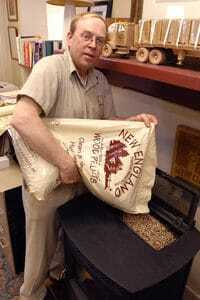 It is able to accommodate a 40lb bag of pellets in it’s hopper, and requires minimal installation work. The heat output is consistent and radiates a comforting warmth throughout the room. The stove is also able to be directly vented, so you can install it into an existing chimney. This feature allows setup to be remarkably brief. Where this model truly shines is with its programmable features. You can use the controller at the top of the unit to set specific temperatures that are based on the day and hour. This means you can have the temperature set lower during the nighttime when you are sleeping, and higher during the day when you need more warmth. This is a great idea for those who are trying to conserve their pellet fuel. You can still manually adjust the thermostat or burn intensity (5 levels) if you don’t feel like programming it. The best part about all of this-there’s an included remote that can do everything we just mentioned. These high quality and innovative features would be in vain if the customer service were shoddy, but this is the polar opposite with Castle. They are the only pellet stove company that offers live customer support. In the event that a part needs replacing they stock all service parts to make maintenance a breeze. This allows buyers to purchase with confidence which is something everyone appreciates. This service is even extends to the entire stove itself, which will be replaced in the event of an fault. The only downside we can think of is that the Castle Serenity might be a bit small for some homeowners, but this is a minor complaint in light of the other benefits. Overall, if you have a smaller home and want a highly reliable appliance with programmable options-this is the purchase for you. For a more in-depth look check out the full Castle Serenity Review. Check Prices & Sizes on Amazon! Pleasant Hearth is a big player in the industry. 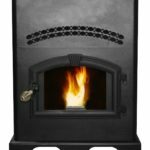 You may have read about them in some of our other content, but we love them for making a great pellet stove at an affordable price. With this product their philosophy is no different-maximum value for minimum price. Overall, this mentality works out well, but there are some quality control issues we will cover below. To begin with, this stove is a powerhouse in both heat output, and hopper size. If you want to warm a large area this model has what it takes. A woman living in Colorado mentioned that it kept her toasty even in 5 degree temperatures. The temperature will remain constant due to a control system that automatically maintains the temperature you initially set. Besides these 50,000 btus of power there is also an included blower that can push the hot air through your house more efficiently. The hopper can hold three bags of pellets at 40 pounds each, so you will be able to wait a day between refills if you like. Compared to other stoves’ hoppers this is three times the capacity. What this looks like in practical usage cases (considering average 1 bag consecution per day) is you refill every three days. One of the biggest concerns people have when purchasing stoves is dealing with shipping and installation. The product is shipped attached to a pallet, so when you get yours you will have to unscrew the legs. This helps cut down on shipping breakage, which is actually a big problem with some of the other stoves we have reviewed. Other than this simple step, setup is considered relatively easy by most users. As always, we recommend professional installation to ensure safety and adherence to local zoning regulations. If you choose to install on your own then do it at your own risk. Appearance wise, it takes up a relatively small footprint in the house, and is simply styled. The chrome accents on the handle and ceramic glass viewing window add to this cozy vibe. One other plus is the domestic construction. Always great to hear that the good ol’ US of A is putting out some great products. It is worth noting that the flame pattern will not be as beautiful as a log version. With pellet stoves you get a yellowish flame that does not flicker as much. The majority of reviewers find this unit to be a workhorse that keeps them comfortable, but some have also had issues with the reliability of the components. Most common, is for the fan or augur (feeds pellets to the hopper) to stop functioning. There is a 5 year limited warranty, but most important components only have a 1 year warranty making the decision slightly riskier. Overall, if you need maximum heat and want a machine that can cover a large area efficiently-this is an ideal buy for you. If you want to learn more read our our full pleasant hearth pellet stove review. 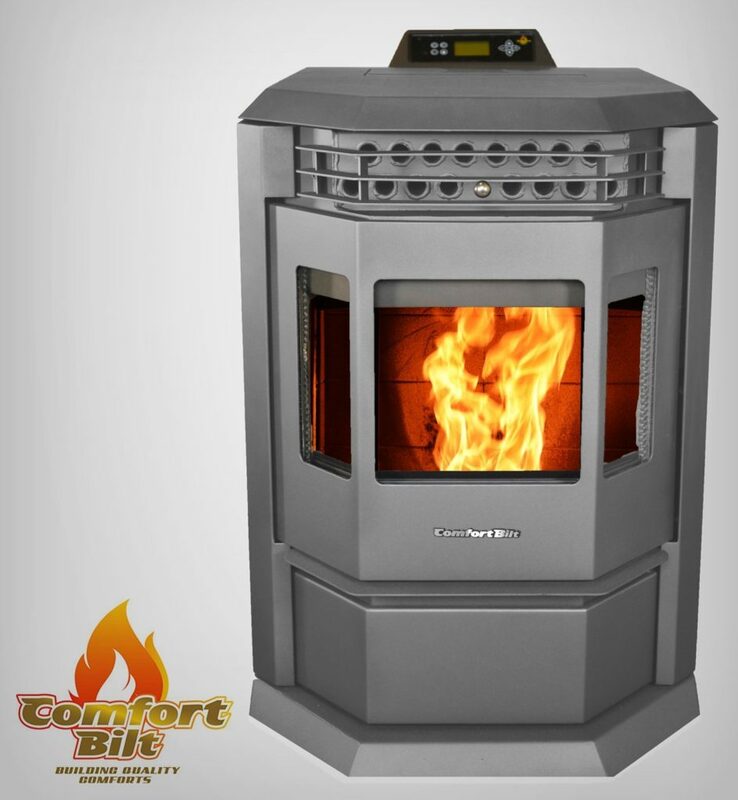 The Comfortbilt pellet stove is very similar to the Pleasant Hearth in heat output and efficiency, but differs in its construction and reliability. Whereas the Pleasant Hearth had some complaints for poor quality parts, the Comfortbilt has received accolades for its hefty construction. Customers have raved about the high quality of certain components like the door’s rope gasket. Aside from quality manufacturing, the product comes with the normal suite of electronic control features such as 24/7 automatic runtime and a programmable thermostat. These are fantastic, but some reviewers struggled to actually understand how to use them. The important thing to note is that even if you just limit your usage to the basic features this stove still fits the bill. There are also the classic pragmatic features such as a built in ash pan and automatic ignition. In regards to general usage this large machine is well regarded for its high heat output. The efficiency rating is higher than the industry average, which means you will get more heat per bag of fuel. People rave about how even for slightly larger homes the Comfortbilt does a great job. This performances seems to extend past the initial months/year of purchasing making this a reliable options. Speaking of pellets, Comfortbilt claims the hopper can hold 55lbs, but in customer experience it seems that around 40-50lbs is more accurate. One minor quibble is that the hopper opening is small relative to the size of fuel bags, so you have to be careful when loading. Alternatively, you could pour the pellets into a bucket and then transfer them into the stove, but most people just prefer going at it with the bag. Finally, the design is a slightly more modern and utilitarian aesthetic with the large window helping to showcase the fire, and lend a cozy atmosphere to whatever space the product is in. While it may not be the most rustic, we believe any concerns should be overlooked in light of the heating performance. It is worth noting that the US distributor is very helpful to his customers, and does everything in his power to leave them satisfied. A large part of identifying a great pellet stove is making sure there’s a company standing behind the purchase ready to support you every step of the way. This is one of those cases. There is a one year parts warranty, and if you ever need any help with installation/technical work there is support. Overall, this is a great choice for large spaces. The downside is that it costs about 400-500 more than its closest competition the Pleasant Hearth. In the end the decision is up to you, but if you have the choice we would recommend that you go with the Comfortbilt. Still undecided? Check out the full Comfortbilt HP22 review we wrote covering this great stove. This article is technically meant to point out exclusively our favorite products , so in this case we thought it necessary to briefly cover the worst as well. There are takeaways that will help you understand warning signs in other products you may be thinking of purchasing. 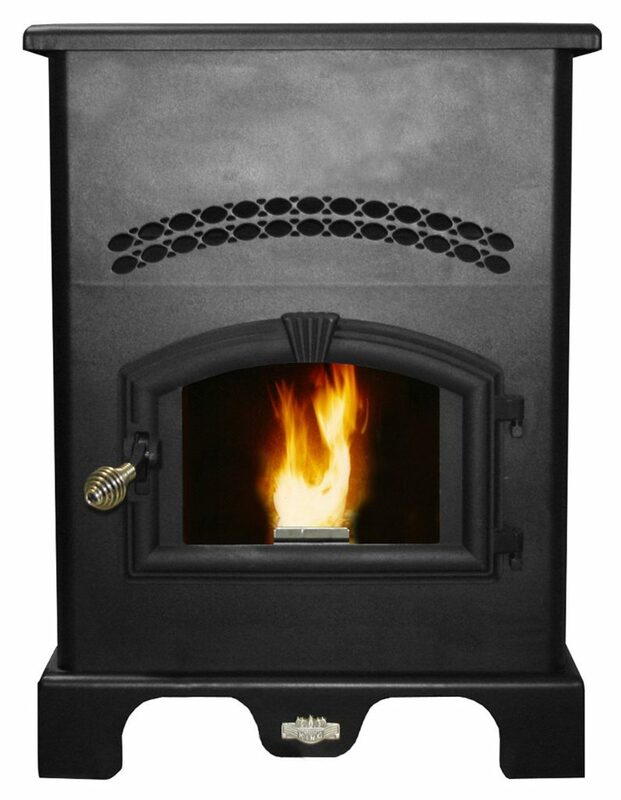 One of the biggest complaints about this bad pellet stove is that the parts deteriorate. One owner had the augur (the critical part that feeds pellets to the machine) break down multiple times. Another reviewer had to have the electronic components replaced multiple times….the list goes on and on. Read through the amazon ratings, and all you’ll find are dissatisfied customers who have become close with USSC’s (bad) support. Another issue with this item is a fire hazard caused by two holes on the bottom of the unit. There are supposed to be bolts inside those holes, but that is not always the case as one user found after his version started smoking. Quality control errors as egregious as those outlined above should never be the most well known features of a product. If you want to save money then purchase a Castle Serenity or save up for a bigger model, but do not, I repeat DO NOT purchase the US 5500M King Pellet Burner. It is more like a peasant than a King. 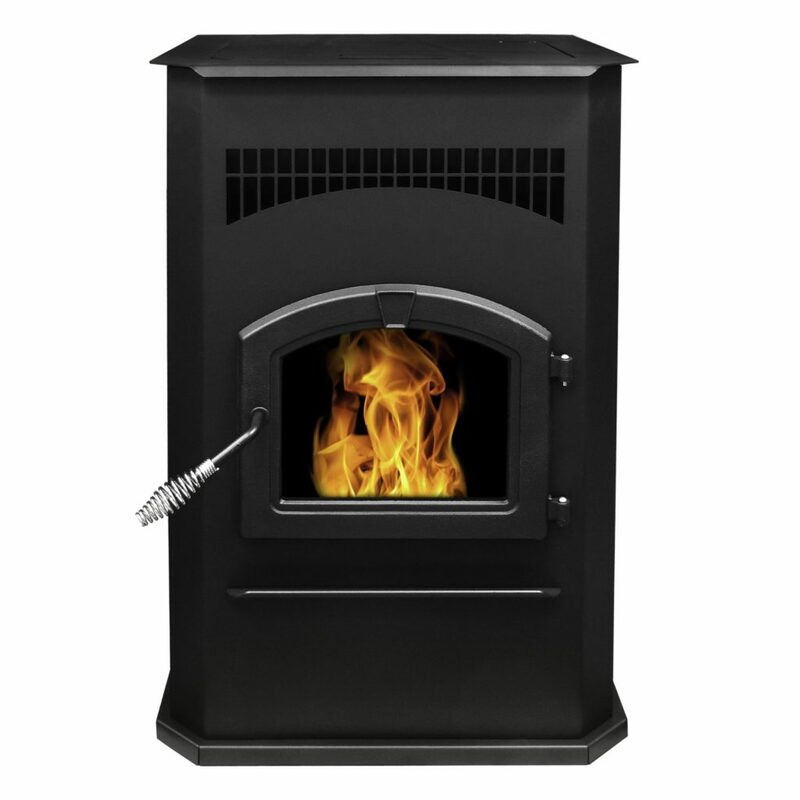 This is a small little pellet stove that will get the job done without too much trouble. It has a pretty slick operating interface, which allows you to see temperature, what phase of combustion it’s in, and whether the feeding motor is working. Other than the display the rest of the design/features is admittedly average, which is not a bad thing. We have a few qualms with it though. One is the high price, which does not make sense considering the size of the hopper. Another, is the unclear heat output. In a response to a customer’s inquiry the manufacturer stated that the model would heat 1,800 square feet easily, but could even go as high as 2,500 square feet based on the height of the room. This approximation is exceptionally wide, when you consider other manufacturers will give a single digit response. There is truth to the fact that heat output will vary based on room size, but the lack of a specific number seems odd to us. The build quality varies highly. Some users get stoves that work fine for years while others have to quickly replace parts or seek out maintenance. There are even some reports of welding issues that have caused smoke to leak from the unit while in use, yikes! Overall, this seems to be a reliable product, but is relatively unpopular with consumers. If you don’t like anything by Comfortbilt, Pleasant Hearth, or Castle then this is probably the choice for you. 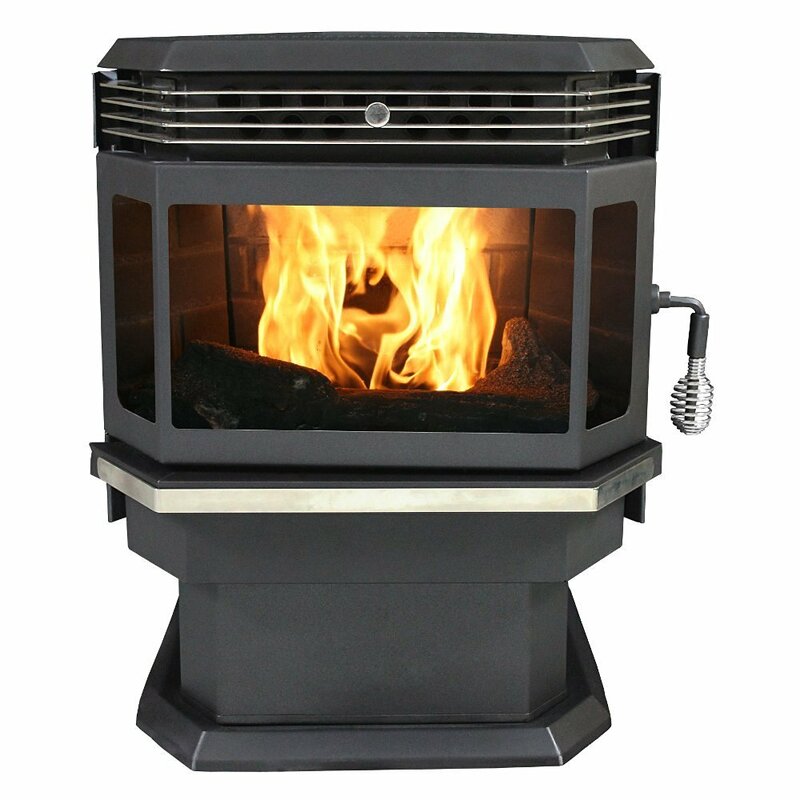 If you still want more info then be sure to read our full US Stove 5660 review. How Does a Pellet Stove Work? 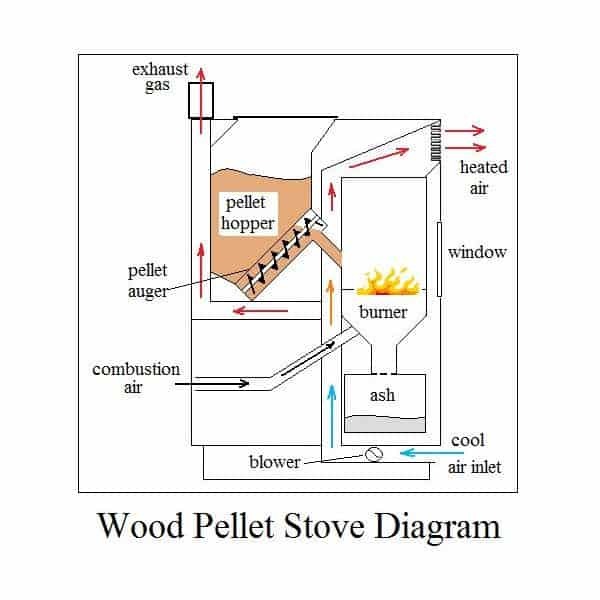 It works by burning wood pellets (vs. logs like a wood stove), which are compressed pieces of wood waste such as sawdust. Below is a diagram that will be helpful in understanding the entire process that will be described. Sometimes there are additives mixed into pellets like glue and the ratio of wood types (hardwood to softwood) varies. These variations in quality make it very important to only purchase high quality pellets like Kirkland Premium (one of our favorites). You’ll be buying a lot considering that most stoves use a single bag per day. Make sure to test some varieties out before committing to a large order. The fuel you can use will be limited by the state that you live in. The majority of suppliers are regional. Ideally, you want a pellet that produces very little ash and buildup in the stove. They will be delivered on a pallet, so make sure you have space for them in your garage-you don’t want them getting wet. The pellets are loaded into the hopper. This is the storage tank for the fuel. Most hoppers store about a day’s worth of pellets (this is approximately 40lb) with some holding up to three times that amount. They are fed into the burn pot (steel bin for burning) by an augur (a corkscrew conveyer like an archimedes screw). There are also gravity fed versions that do not require an augur, but these are normally much larger machines. The speed at which this process occurs is what dictates how hot the stove burns. A faster feed augur load speed leads to more pellets being burned at once and thus hotter temperatures- vice versa for slower speeds. They are ignited by an electric ignitor or manually with a grill lighter. As you’ll read below, this does indeed mean the stoves require electricity, but it’s not the only reason. A series of electric combustion fans and air intakes causes them to burn intensely, and the heat to radiate around the room (also excretes exhaust gas). Air is fed into the burn chamber where the pellets are deposited by the augur in order to feed the flames. The fan (either built in or purchased separately) maximizes the heating speed of the unit. As you may have noticed from the step-by-step, these little machines require electricity to operate the fans, thermostat, and circuit board which controls the operation. For everyone who believed pellet stoves were their way of sticking it to the man and becoming independent of the grid…I’m sorry. It’s not all bad though. These electrical components make the final product more hands off than log burning burners, but the downside again is that you are reliant on electricity. A simple solution would be to connect a backup battery pack that uses an inverter and a battery from a small car or boat. There are non electric varieties, but those are rare. Efficiency: Since the internal air circulation is managed by electrically programmed and optimized fans/blowers, pellets burners have a high average efficiency. The actual number is between 60-80% efficiency depending on the model (as rated by EPA). This means you will be getting more heat from your fuel. Save Money: Overall, the cost of heating is cheaper than using electricity or oil (but still not as cheap as natural gas). Additionally, there are some states that give tax incentives. The other benefit is that there are not as many price fluctuations like you would experience with some other fuel types. This allows you to better budget for fuel costs with more peace of mind. Clean: They burn cleanly and produce only a fine ash. If you take care of your model it will not produce creosote, which is a sticky black substance that can accumulate in the exhaust, ignite, and pose serious damage to property. Easy Maintenance: Simply dump fuel in, and clean the ash out. This is a bit oversimplified as you might also have to clean the glass or replace parts, but for the most part it is not that bad. In terms of glass, some stoves have self cleaning glass. If your stove doesn’t you can always purchase stove glass cleaner to help you with the job. In regards to part repair, it’s important to look at company’s support and whether they offer part replacements/warranty/live support etc. Approved for RV homes: ALTHOUGH not all of them, so make sure you check that yours meets requirements for use in a mobile home. We can’t stress this enough-be careful! Horizontal Venting: Unlike a other stoves, which requires a vertical exhaust pipe, these have a double walled exhaust pipe that is oriented horizontally. This mean you can route it directly outside same as you would while cooking. This can make the stove easier to install in theory. We recommend hiring a professional to handle this step for you. This is a complex process, and involves drilling holes into your walls for airflow/ventilation. Be sure to use the best pipe. The average price of installation is between 300 to $1,000 depending on how much work will be needed. This may be steep, but it is better to be safe than sorry. Additionally, this is pretty much a one time fee considering you’ll be able to use the same holes in your house for a different stove. If you are installing on your own then this video from This Old House may help. Refill pellet fuel daily (depending on the size of the hopper). Most hoppers take a single 40lb bag of pellets, so bear in mind you will have to lift these bags to the stove. Clean the glass. There is some glass that is able to tidy itself up, but if not then you can expect to scrub away the grime. This is valuable for aesthetic reasons, but it is also important so you can assess the quality of the burn. Flame color and intensity are signs of how efficient the burner is, so you want to see these signs. Empty the ashpan once a week (average if you are using daily). Thankfully, most stoves sold are equipped with these. You simply remove it, dump the ash, and replace. Examine (daily) the burn pot to make sure the air vents are not being blocked by anything. Also, scrape any bits of hardened ash (these are referred to as clinkers) from the pot. Professional cleaning/examination once a year. This will take care of hard to reach stuff like vent cleaning, and give you peace of mind. Ash Vac: An ash vacuum is a great way to easily get rid of all the ash that wasn’t caught in the ash pan. It’s worth noting, that if you try to dispose of ash by dumping it some particles may become airborne. Ash particles are not healthy to inhale, so using an ash vac will limit airborne exposure. Finally, you’re less likely to make a mess vs. dumping the ash into a plastic bag. We recommend the PowerSmith it has rave reviews, and an affordable price. Its capacity isn’t as high as some pricier models (Cheetah) but it will get the job done. Coal Scuttle: These can be helpful for scooping wood pellets into the hopper if you don’t like/don’t have the strength to dump the entire 40lb bag in at once. Here’s a simple and elegant Scuttle from our friends at Panacea. Stove Fan: We’ve done an entire post with some of our favorites, but these mechanical marvels really do help. They are fans that sit on top of the stove and are powered by the emanating heat. The help spread the heat around your home and require no maintenance or batteries. The most popular option is the EcoFan. This is always a core consideration when making any purchase let alone a quality pellet stove. Just to give you a better idea of what you can expect, most pellet stoves worth your time cost around $1-2k. This is quite a large sum of money, so gauge you’re alternatives closely before purchasing. You can get wood burning stoves for cheaper and there is also the option to go with an alternative technology such as infrared or alcohol heating. Q: Where to get fuel? A: The best woodfuel is going to have 1% or less ash content (per 40lb bag) additionally you will want to decide whether to purchase hardwood or softwood pellets. Softwood has a 10% higher heat output, so that is what we recommend. You can buy pellets from stores or online. Many pellets brands are only available in certain geographic regions, so be sure to look around. Also check out our best wood pellet guide. Q: How long before you refill the hopper? 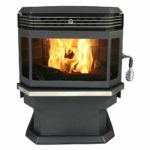 Q: What is the best pellet stove for RV? A: Not all mini stoves are certified for mobile home usage, but the one of our favorites is the Dickinson Marine Newport. We put together a review of this stove, and from what we’ve read it is a great performer in small spaces. For a slightly more powerful option there is always the ever attractive Castle Serenity. Additionally, if you buy a separate clean air kit, the US 5660 Bayfront is also an option. Q: What is the best small pellet stove? A: Again, this depends on personal preference, but the most popular by far is the Castle Serenity. 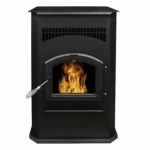 This is a great option, but if you are looking for something less expensive then we have a full guide to cheap pellet stoves. Ultimately, it comes down to needs. If you care about power then the Castle isn’t the best because it is better in smaller spaces. Someone who wants power would be debating between the Pleasant Hearth and the Comfortbilt-a decision that will probably come down to willingness to pay the premium for the latter. The best pellet stoves can be a great source of warmth for your home, and depending on what you currently use as fuel (eg. heating oil) they can be cost effective heating alternatives. We hope you enjoyed this article, and as always be sure to contact us if you have any ideas for future content we should include.